6 highly-fragrant candles labeled with unique Christmas-themed pictures. These amazing scented candles come in 8oz canning jars and are priced at only $10 each! Sell For Only $10 Each! A Choice of 6 Beautiful Candles: Christmas Memories (brandied fruit), Balsam Fir (woodsy blend of winter trees), Christmas Wishes (candy cane and caramel apple), Backed Apple Pie, Gingerbread, Christmas Spice (cinnamon, clove, nutmeg and allspice). Each candle burns up to 55 hours. 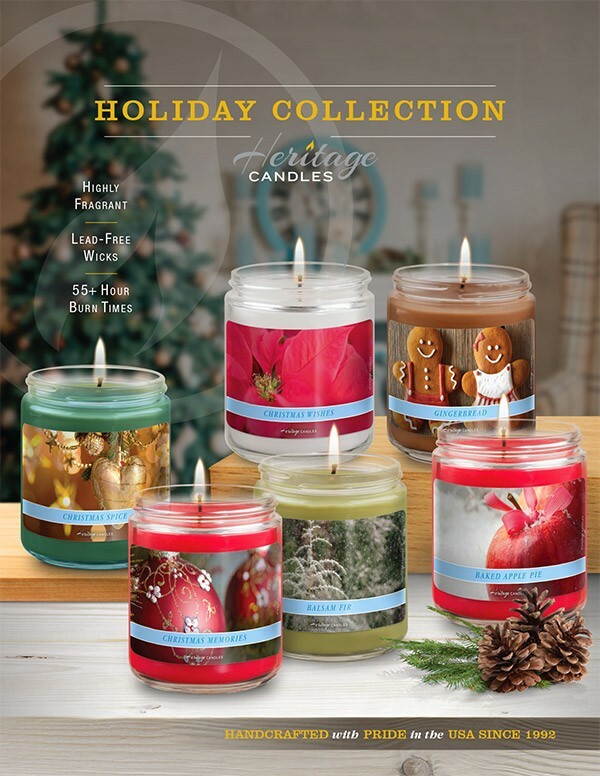 Raise money with ease using these wonderful "Holiday Art Collection Candles". Each magnificent 8oz candle features a beautiful holiday themed picture. They are made from the highest quality blended waxes and fragrances available, hand poured right here in the USA! FREE to Start: The Holiday Art Collection Candles fundraising program costs absolutely nothing to get started. Simply let us know how many fundraising participants you have and we’ll send 1 order-taker for each of them, at no charge. Reach Your Fundraising Goal: Your group keeps 40% of everything they raise. Priced To Sell: At only $10 each, these candles are very affordable, making a perfect gift to yourself, a family member or a friend. Free Shipping and No Minimums: Your group receives Free Shipping when you sell 120 candles or more of fundraising product. It's easy - a small group of 20 participants has to sell approximately 6 candles each to get free shipping. And there are no minimums – order as much as you sell! Your Group Keeps 40% of Everything You Sell! How Does the Holiday Art Collection Candle Fundraiser Work? 1. Order 1 Holiday Art Collection Candle order-taker PER fundraising participant – they’re FREE of charge! 2. Have your group members show the order-taker to friends, family, neighbors, and or co-workers and invite them to purchase 1 or more. (Note: Your participants will collect the funds up-front, and will take note of their supporter’s name and mailing address on the order form included). 4. Place your product order with us by completing and submitting the Order Form online or by fax, and forwarding payment. Product Availability This brochure and products in the brochure are available year round. Our group decided to try something new for our holiday fundraiser and we ended up doubling our sales! Although we didn't have much participation we still ended up raising over $2,000 profit for school events. We needed a quick fundraiser before Christmas so I just printed JustFundraising's $10 candle order-takers right off their site. We just completed a 1 week blitz and sold 600 candles - wow! I was amazed. Thanks so much! Our school raised over $1,500 profit which will help pay for supplies, field trips and families that needs some extra help. We have a very small church, so i was really impressed on how easy it was to sell these candles. The Gingerbread and Christmas Spice were big sellers! We managed to profit $840, which for our small church will help out significantly this Holiday season. Our High School Band Boosters raised over $7,000! Although we only had 25 sellers participate, the band members took the brochures home over Thanksgiving and had a bunch of sales. All of the money raised will help pay for a trip to Disneyland over the Easter break. We sold these candles for our annual holiday fundraiser at church along with the Journey Of Faith candles and raised over $500. All the money raised will go towards maintenance expenses for the church.